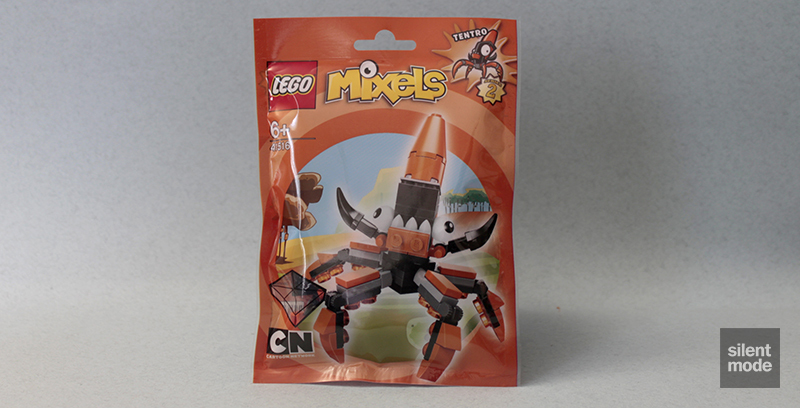 Welcome back to another Mixels Series 2 review, and by now most of you will have gotten your hands on all of them, thanks greatly to my other reviews! But we’re going to keep rolling and continue our examination of the Flexers tribe. On the surface, Tentro – today’s star Mixel – looks like a rather ambitious build, thanks in part to its four legs at different angles. This would certainly catch your attention in the store. In comparison to Kraw, there are a lot of very interesting parts in this set… at least they’re interesting to me, anyhow. There are plenty of different parts in Orange for anyone who’s a fan of that colour, including some Orange cheese slopes and “baby bows”, but what grabs my attention is four each of two of the new joint parts, which immediately make this set good enough for obtaining multiples. We also have two of the bar holder parts shown in the last review, as well as two more printed balls for eyes in White. An immediate difference with Tentro over the other Mixels is its very small “core”, made up of the four socket joint plates, a Black 2×2 plate and a Black/Medium Stone Grey turntable. 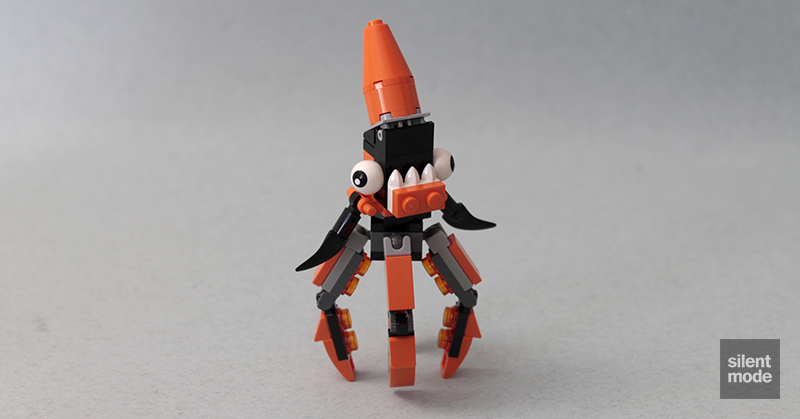 This is shortly (depending on your building speed) accompanied by four identical and detailed legs, complete with “suckers” on the bottom. Seeing these legs spread is a sight to behold, much like… I will leave that analogy alone. Tentro’s head isn’t nearly so elegant, however, but it very much looks like a squid with teeth, which is what it appears to resemble. The bar holder parts hold a pair of large “tooth” parts in Black, which could resemble the ends of tentacles or a pair of sharp ends. After a reasonably quick build, we get Tentro: a Mixel that fancies itself as a professional dancer, but has trouble balancing with its four left feet. It’s much more at home in the water. The incredibly elasticated TENTRO is one of the most powerful of the Flexers tribe from the Rubberlands. Despite being strong and su per-intelligent, TENTRO lacks confidence. 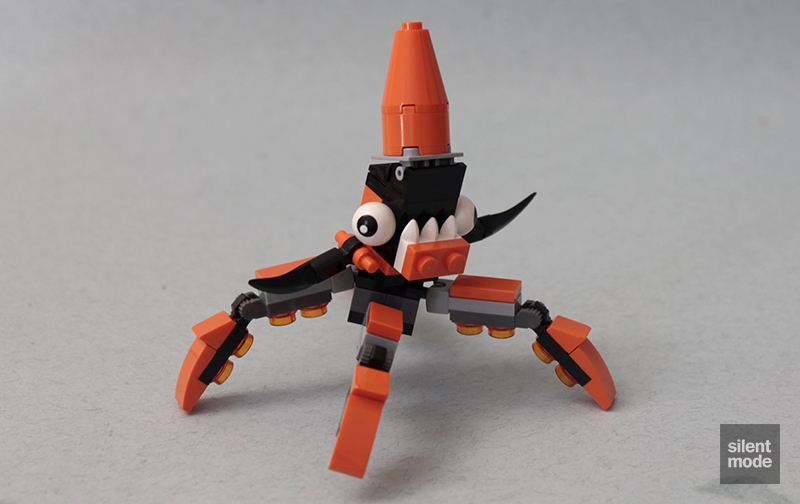 No one knows why, though, because this flexible Mixel has tentacles that pack a huge punch and the ability to climb any surface and capture any Nixel that attacks. The 1×2 plate and cheese slope in Orange will come in handy, out of these four leftover parts. This is my favourite of the Flexers tribe, even though Tentro’s legs suffer from the usual issues brought on by the stepped hinge plates rather than smooth ones. What makes this Mixel interesting is the possibility of hanging it on a surface, such as the top of a computer monitor, a lamp, or whatever you can think of. In terms of aesthetics, I’m not sure why a plate was used in front of Tentro’s teeth instead of a tile – but I guess it was because they couldn’t just have two 1×2 Orange plates in the set. I’m going to give this one 6.8/10.